SMstudy provides a global community for all sales and marketing professionals and also an ecosystem for sales and marketing experts to sell or promote their unique content to a wider audience. SMstudy offers subscription services for various sales and marketing related courses based on the SMBOK®Guide and also other sales and marketing courses offered by marketing professors, experts, companies, and universities which are hosted in SMstudy platform. SMstudy also offers various certification exams based on the SMBOK® Guide. Associate Level Certifications— The introduction modules (first two chapters) of each book are available at no charge to interested individuals. 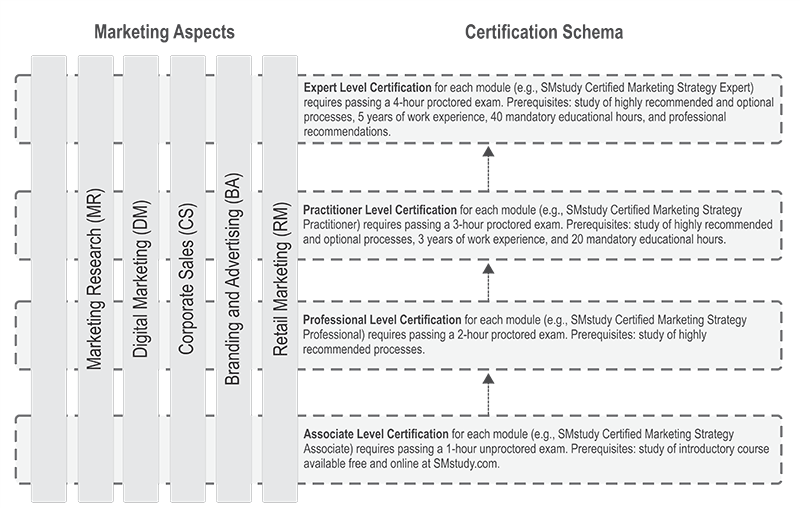 All Aspects of Sales and Marketing have an applicable Associate-level certification (e.g., “SMstudy® Certified Marketing Strategy Associate”). The certification exams are free and not proctored; and candidates have one hour to complete each exam. There is no work experience requirement and no mandatory educational hours in addition to the recommended study. Silver Subscription: This is a lifetime free subscription and a subscriber will have access to all the free resources and benefits provided by SMstudy and other free content hosted in SMstudy ecosystem by various content partners. As part of this subscription, students will also have access to the Free Associate Level certification exams provided by SMstudy. Gold Subscription: This is a duration based paid subscription and a subscriber will have access to all the resources (free or paid) available in SMstudy ecosystem till his/her subscription is active. The subscriber will have unrestricted access to the SMstudy owned content (based on SMBOK Guide) and can choose any 5 courses each month from the community content. A subscriber may choose more than 5 courses by paying a small fee per course. SMstudy paid certification exams are not part of this subscription package. Certification exams need to be bought separately. On purchase of any paid certification exam, the gold subscription is automatically renewed for 3 additional months. Upon expiry, Gold Subscription is replaced by free Silver Subscription.